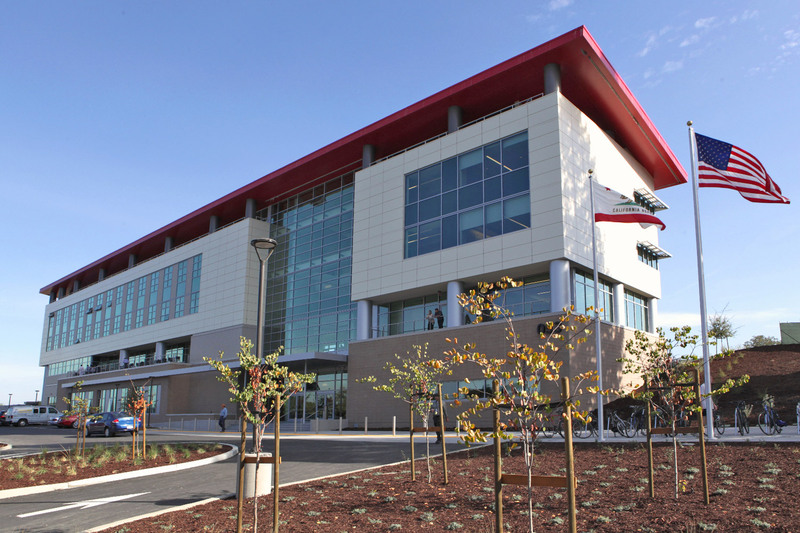 Crosby Group provided complete structural engineering design services for the new Stanford Linear Accelerator Center’s (SLAC) Science and User Support Building (SUSB) located in Menlo Park, California. The SUSB is a critical project for SLAC’s long-range development of its science mission and will be a “front door” gateway structure at the SLAC campus supporting the "One Lab" collaborative-science concept for the campus. The SUSB building offers approximately 63,000 square feet of space and houses SLAC's Director's office, user support, communications, security, auditorium, cafeteria and conference and visitor’s center. The structure consists of a 4-story, 48,000sf office building constructed with steel special moment resisting frames, and an adjacent 1-story, 14,700sf auditorium with 350-fixed seats constructed with special concrete shear walls and 89’-0” long span steel trusses. Sustainability and energy efficiency are important considerations, especially for a facility built under the aegis of the Department of Energy. The SUSB will be minimally LEED Gold certified and a High Performance Sustainable Building (HPSB).